Harper was responding to a Federal Court decision from January 2015, put forward by Zunera Ishaq, a (then) permanent resident who challenged (and effectively overturned) the reigning Conservative government’s 2011 ban on the niqab during citizenship ceremonies. What has unfolded since has been the most heavily publicized single-issue controversy in Canadian politics in recent memory, with the niqab taking center-stage as a significant issue in the upcoming federal election, to be held on October 19, 2015. In this post, I will begin with some background in order to help contextualize this affair, and pose the following as an open question in need of further analysis: while news media seem to be overwhelmingly opposed to the Conservative government’s desire to ban the niqab in citizenship ceremonies, the proposed measure continues to be supported by a considerable majority in national polls. How might we account for this discrepancy beyond the political rhetoric for and against the ban? Here I take my lead from Talal Asad, who, in a 2006 essay on the “Islamic Veil Affair” in France, argues that such controversies reflect the unstable authority of state power, where, in the state’s attempt to define a symbol (such as the veil) under law, it must follow a line of reasoning that is both illogical (e.g., because it tries to fix meaning upon something that is fluid and unstable) and authoritarian, claiming to uphold things like tolerance and equality while asserting its own sovereignty as the right to define meaning once and for all. The issue of the niqab in citizenship ceremonies first gained national attention in Canada back in December 2011,  when then Minister of Citizenship, Immigration, and Multiculturalism Jason Kenny announced that women would have to lift their veils when taking the oath, noting, “This is not simply a practical measure. It is a matter of deep principle that goes to the heart of our identity and our values of openness and equality.” While this issue largely flew under the radar at the time, a much bigger controversy emerged in Québec in September 2013, when the provincial Parti Québécois government introduced The Charter of Secular Values  (Bill-60), which included a widely publicized graphic on “conspicuous religious symbols” that would, if passed, be prohibited for all those working in the public sector (see Desmarais 2013; Sheedy 2013; Selby 2014). While the Charter failed to pass and was largely opposed by political parties around the country, it was clear to most observers that its main target was Muslim women, as evidenced by several reported attacks, and a common rhetoric of opposition in Québec that framed the veil as “anti-women.” Here parallels were frequently drawn between the hijab and the province’s own experience with habit-wearing Catholic nuns, who had held a significant presence in the public service in that province until the “Quiet Revolution” of the 1960s, when the secularization of state institutions began to take hold. Many commentators have argued that part of the reason for the current Conservative government’s decision to challenge the Federal Court’s ruling is a calculated ploy to gain votes in seat-rich Québec, where they have historically held little sway and where the left-of-center New Democratic Party (NDP) currently holds 59 of 75 seats. Given Québec’s strong anti-clerical sentiment, its regnant self-identity as a “distinct society,” and its preference for a variation of French laïcité, which tends to privilege “secular values” over “religious freedom” (the latter being a more common trait of political liberalism), it is not surprising that the issue of the niqab has had more traction here than in any other province and has likely contributed to diminishing the NDP’s standing in the polls. The argument that the niqab has been used by the Conservative government as a wedge issue to divide the populace and distract from more substantive concerns (e.g., the economy, climate change, and missing and murdered Aboriginal women) is, to my mind, a thoroughly convincing one, which has been echoed in more op-eds of late than I can count (see e.g., here, here, and here). I also agree that it has tapped into a current of Islamophobic sentiment (see e.g., a recent Angus Reid survey) that has a long history in the Euro-West, particularly the Orientalist discourse linking the need to save oppressed women from “barbaric” foreign men—a trope discussed in Leila Ahmed’s A Quiet Revolution, among many other texts (see e.g., Fernando and Selby). In this sense, it enters into a complex social field of racialized sentiments—regardless of how it may be interpreted otherwise—that has antagonized Muslim communities and resulted in several verbal and physical attacks against hijab and niqab wearing women in the last two months. June 2, 2006, 18 men are arrested in Toronto (dubbed the Toronto 18) for an alleged terrorist plot said to be inspired by al Qaeda and in light of Canada’s involvement in the war in Afghanistan. A December 2011 law required that niqab and burka wearing women must remove their veils during citizenship ceremonies or remain permanent residents. In 2013, a study is released interviewing 81 niqab wearing women, conducted by religious studies professor Lynda Clarke, and sponsored by the Canadian Council of Muslim Women. April 22, 2013, a “terror plot” was foiled by Canadian law enforcement and security units, where two men with alleged links to al Qaeda in Iran planned to blow up a passenger train between Toronto and New York. See my post here. October 20, 2014, Martin Couture-Rouleau, ran over two men outside of Montreal, one of whom, uniformed Warrant Officer Patrice Vincent was killed. It was widely reported that Couture-Rouleau was inspired by ISIS in carrying out this attack. October 22, 2014, Michael Zehaf-Bibeau, shot a uniformed officer, Nathan Cirillo, in front of the National War Memorial on Parliament Hill in Ottawa, (Canada’s equivalent to the White House) who later died in hospital. It was also widely reported that Zehaf-Bibeau was inspired by ISIS. October 24, 2014, a mosque is vandalized in Cold Lake, Alberta in the wake of the Montreal and Ottawa murders. January 30, 2015, the Anti-Terrorism Act, Bill C-51, is tabled, which gained Royal Assent on June 18, 2015. The Bill received widespread criticism for its extensive surveillance measures and targeting of Muslim and Indigenous groups. February 6, 2015, the niqab ban from citizen ceremonies was struck down by the Federal Court on the basis that it violated the government’s own immigration laws and that it was in violation of sections 2(a) and 15(1) of the Canadian Charter of Rights and Freedoms. February 17, 2015, the Conservative government tables Bill S-7, the “Zero Tolerance for Barbaric Cultural Practices Act,” focusing on issues of forced marriage, polygamy, and honour killings, which many argue panders to fears of immigrants, and Muslims in particular. March 8, 2015, International Women’s Day, current Defense Minister Jason Kenny, tweets, “On ‪#IWD2015, thank-you to the ‪@CanadianForces for joining the fight against ‪#ISIL‘s campaign to enslave women & girls.” The tweet is accompanied by an image of burka-clad women chained together, which Kenny failed to acknowledge was a reenactment as part of a Shia Ashura festival. March 10, 2015, Prime Minister Stephen Harper declares the niqab “anti-women” in the House of Commons and vows to challenge the Federal Court ruling. March 16, 2015, Zunera Ishaq pens an op-ed explaining her reasons for wearing the niqab and challenging the Conservative government’s policy. June 10, 2015, in an interview with Vice News, Immigration Minister Chris Alexander conflates the niqab with terrorism. June 18, 2015, the “Zero Tolerance for Barbaric Cultural Practices Act” receives Royal Assent. June 19, 2015, the Conservative government introduces the Oath of Citizenship Act, which would require all people to show their face during swearing-in ceremonies. September 17, 2015, Stephen Harper makes reference to “old-stock Canadians” in an election debate, which several commentators argue plays into the on-going politics of division that is linked to the niqab. October 2, 2015, the Conservative government pledges that it will implement a tip-line if they are re-elected where citizens can report on “barbaric cultural practices,” sparking a wave of controversy, including condemnation from the Canadian Bar Association, and a spate of backlash on Twitter. 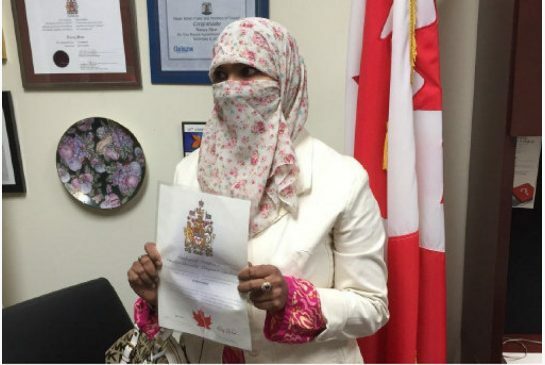 October 5, 2015, Zunera Ishaq, the woman who challenged the Conservative government on the ban, is sworn-in as a Canadian citizen while wearing her niqab. October 9, 2015, over 500 Canadian academics sign a letter condemning the “politics of hate” in relation to the niqab affair. Despite the Federal Court’s ruling that the wearing of the niqab in citizenship ceremonies is a protected “religious freedom,” along with assurances that niqab wearing women will have their identities verified by another women in private prior to the ceremony (thus alleviating supposed concerns over security), widespread opposition seems to prevail, particularly the notion that the niqab is inherently “anti-women” (a point endorsed by many liberals who nonetheless opposed the ban) and contrary to “Canadian values” (a point that said liberals typically contest, arguing that “religious freedom” is a higher value). Asad notes that it seemed to matter little in the French case whether hijab wearing women asserted that they were doing so as a matter of “freedom of choice,” and that even when such self-identifications were made, it was often assumed that this was a form of “voluntary servitude” that reflected a fanatical commitment deemed inappropriate and even dangerous in a secular state. That Ishaq herself, along with other niqab wearing women have spoken out publically and asserted their autonomy throughout this affair (see, e.g., the Salafi feminist, who recently appeared in Al Jazeera’s The Stream) offers an interesting parallel with the French case, and highlights the gap between public professions and symbolic power. Given the tiny percentage of women who wear the niqab in Canada and its relative obscurity in public discourse until late January of this year, it is not surprising that it has been a potent symbolic discourse in light of its ready-made links to things like “terrorism” and “barbaric cultural practices.” In the absence of a more robust and sustained public conversation that is able to destabilize these long-standing tropes, what will likely continue to stand in its place is a regnant state-centered discourse, which has framed this issue as one of women’s rights vs. religious freedom. In both cases, the complexity of the niqab is elided in favor of a narrative that reflects competing conceptions of Canadian identity/values. If, as Asad argues, there is no unified meaning or reality to Muslim veiling practices, and that it is, instead, part of an evolving tradition that is influenced by competing theological interpretations (e.g., on what constitutes modesty), cultural preferences and variations, state interventions, and so forth, then what is primarily at stake in such debates is not whether the niqab is inherently “anti-women,” but rather the role of the state in defining what is or what isn’t a religious sign under law. Prior to this controversy, a 2010 human rights challenge made national headlines when Naema Ahmed sought (and was denied) the right to wear the niqab in government-funded language classes for new immigrants in Québec, which was followed by the proposal of Bill 94, also in 2010, which sought a limit to “reasonable accommodation” in Québec, where burka and niqab wearing women would be denied access to various public services (Chung 2010). This entry was posted in Matt Sheedy, Politics and Religion, Religion and Popular Culture, Religion and Society, Religion and Theory, Religion in the News, Theory and Method, Theory in the Real World, Uncategorized and tagged Alberta, Anti-Terrorism Act, Ashura festival, Bill C-51, Canadian Bar Association, Canadian Charter of Rights and Freedoms, Canadian citizenship, Canadian Council of Muslim Women, Chris Alexander, Cold Lake, Federal Court, International Women’s Day, Jason Kenny, Leila Ahmed, Lynda Clarke, Martin Couture-Rouleau, Michael Zehaf-Bibeau, Naema Ahmed, New Democratic Party, niqab, Oath of Citizenship Act, Parti Québécois, Patrice Vincent, Quiet Revolution, religious freedom, Stephen Harper, Talal Asad, The Charter of Secular Values, the Salafi feminist, Toronto 18, Winnipeg Manitoba, Zero Tolerance for Barbaric Cultural Practices Act, Zunera Ishaq. Bookmark the permalink.